Although published in 2008 and available at Barnes and Noble and on Amazon.com and other internet book sites, a book about and by a girl growing up in Magnolia seems to be not very well known by people who now live in the book's setting. Those Magnolia natives who do know about it and have read Magnolia Girl's Adventures probably had the same reaction as that expressed by an other native of Magnolia, Alice Gaylor Rose. who said, "I would never have imagined some of those things taking place -- such as Jesse Baker in Washington and at the beach with sunburned feet". The late Jesse Hill Baker was the father of the book's author, Clara Baker McGrath, now retired and living in North Myrtle Beach with her retired husband, Bill McGrath. 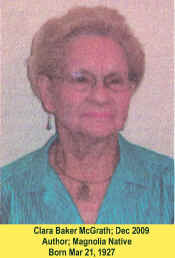 Her mother was the late Allie Lee Ezzell Baker. In addition to Clara, other children in the family were Margel, Irene and Kenneth. The late Jesse Hill Baker was the father of the book's author, Clara Baker McGrath, now retired and living in North Myrtle Beach. Although the book is about Mc Grath's childhood in Magnolia and about her later adult life, most of the time in the Washington DC area, it also tells the history of Magnolia. Tales in the book will no doubt bring back memories to many people who grew up here and it tells about buildings still standing today. In many ways, McGrath's book makes Magnolia and its history come alive. Asked for a brief sketch of her life to precede a brief review of the book, McGrath noted that she was born in Magnolia, where the family lived on Sandy Street, on March 21, 1927 (the first day of spring, she points out). Down the street was a comer grocery and variety story owned and operated by Claude Evans. 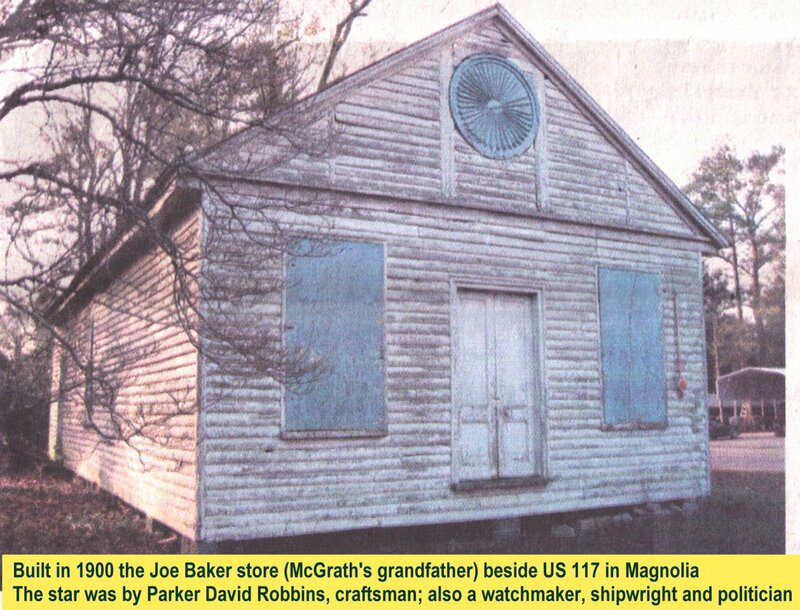 Downtown, next to then-unpaved US 117 was a store, still standing, built around 1900 by McGrath's grandfather, Joseph Hill Baker, from lumber he sawed at his mill, located on Peterson Street. As a child, McGrath attended Magnolia Baptist Church, built in 1921. As a teenager she taught Sunday school. She remembers walking along US 117 and watching it being paved as she walked to and from Magnolia High School, built in 1913. "I attended this school until I graduated from the eleventh grade May 3, 1944" McGrath recalls, noting that hers was the last graduating class before 12 grades were required for graduation, beginning in 1945. McGrath says that, although her father didn't drive because of poor eyesight, he owned at various times a Model T Ford and a Model A Ford. "Our main transportation was a wagon pulled by mules," McGrath said. "They moved so slowly that we walked or ran behind the wagon. We did a lot of walking since we lived within walking distance of all activities in town. We had a healthy lifestyle and didn't realize it." In her book, McGrath details much of that lifestyle, one common to most others who grew up in the 1930s era in towns like Magnolia. "Our house was small and unpainted," writes McGrath. "We did not have electricity, or running water; only a well and an old-fashioned pitcher pump. No radio or telephone. Later, my first radio was one I won from selling 'punches' on a punch card. My mother disapproved of this activity, but I sold enough to win a radio. There were not many radio stations to choose from. Later, I took the radio with me to Washington, D.C. I had better reception there." The bathroom, of course, was the outhouse, which McGrath says was a good walk from the house, "with a Sears Roebuck Catalog for convenience". A chamber pot was used at night. "None of these things seemed strange at the time," McGrath writes, "but as time has passed and progress has been made, we look back and we look back and marvel how we coped with such living conditions. In the mid-40s I was surprised that homes in southeast Washington, DC. still had outhouses." "The procedure to take a bath was to use the pitcher pump to fill a small basin, which was heated on a wood stove, making for a good sponge bath. To wash clothes, pails were filled with water then poured into large black iron pots. A fire under the pots heated the water into which clothes were put and scrubbed with a washboard. Two or three iron pots were used for clothes rinsing. Clothes were pressed using an iron preheated on the wood stove. Usually, one iron was heated while another was being used." The family was fortunate, wrote McGrath, in that the family had an extra acre of land behind the house where her father grew corn, green beans, butterbeans, potatoes and strawberries. Some of the vegetables were cooked and served immediately, while others were canned to preserve them. Potatoes were stored under the house, in what the family called the "cold cellar," and children thought it great fun to be asked to crawl under the house to get some potatoes s they were needed. Her dad, said McGrath, paid his taxes from the sale of pecans, produced by trees in the back yard. Several of the pecan trees, she writes, are still living Her dad worked at the Magnolia crate factory and gristmill, owned by her grandfather. Her mother stayed at home when the children were young, but later helped make crates used for packing strawberries and blueberries, harvesting tobacco and at an egg house candling eggs. As a sign of the times, in her book McGrath relates some of the happenings in 1927, the year of her birth. It was the year Babe Ruth hit a record-setting 60 home runs; life expectancy was 54.1; gasoline was 12 cents per gallon; a postage stamp was two cents; Vitamin-D milk was six cents per gall and the average income was $2,400 per year. In those years, writes McGrath. Townspeople were not allowed own chickens or pigs, but since Bakers lived just outside the town limits at that time, they had both, thus eggs and, on occasion, fried chicken and, of course pork. When pigs were fattened and slaughtered, it was a time for neighbors to help make sausage and liver pudding, cook the brains, and pickle the ears and head of the pig. "During those days, the chitterlings were scraped and washed, and filled with ground pork for sausage links and liver pudding," explained McGrath. "Chitterlings were the small intestines of pigs. Later, artificial casings were used. Some people ate fried chitterlings, brains and pickled pigs; all of which were a delicacy to many people. "I never ate any of these delicacies." A childhood incident McGrath says she remembers vividly is waking up in the middle of the night to find "the whole town of Magnolia was blazing." A whole block in the business section of town was on fire, she remembers. Included in Magnolia Girl's Adventures are mentions of people like Miss Macy Cox; of goodies like Jonnie Cakes, Push Outs, Pepsi Cola, honey cakes and penny suckers; about falling out of a pickup truck; her 1944 high school graduation valedictorian address: employment: raising two daughters; life in and around Washington; the neighbor with a gun; a new hair style; nearly drowning; graduating from Coastal Carolina College (now University) at age 71; and what she calls the happiest time of her life. Just over a month after graduating from high school on June 15, 1944. Clara Mae Baker, accompanied by her aunt, Nellie Mae Baker Burns, who lived in New Jersey, boarded an Atlantic Coast Line train in Magnolia bound for Washington, D.C., where she obtained a job with the FBI, at its Southeast FBI Building on Pennsylvania Avenue. She worked there for live or six years, after taking evening classes at Montgomery College in Rockville, Maryland, where she met her future husband, Bill McGrath, from Springfield, Mass. They married Aug. 26, 1950. After her two children, Sandra and Sheila (there are now four grandchildren) graduated from high school, "I returned to the work world," McGrath said. In addition to the FBI, that work world included the National Science Foundation, General Accounting Office and the Food and Drug Administration. She retired in 1989. As to their choosing a retirement home, McGrath says the family always vacationed in Myrtle Beach area, and had bought property in North Myrtle Beach so when Bill retired in 1990 they built a house there. As to how "Magnolia Girl's Adventures" came to be, McGrath simply said. "I have always kept a diary. One day I decided to put the activities from my diary into book form. In retirement, McGrath says her interests include membership in a book club and a poetry club and she has plans to put her poems together and publish them. She is volunteer tutor for reading with kindergarten children in North Myrtle Beach Primary School. She enjoys bridge, reading, writing and swimming. She is chair of sickness and distress for a fraternal organization and writes a monthly newsletter. In one passage of "Magnolia Girl's Adventures" McGrath reflects in general about her childhood writing, "We were poor but we had what we needed food from the garden and hams in the smokehouse and chickens in the yard. During, the Depression, we were given fruit by the community services during the winter. We did not go anywhere except to church, the grocery store, drugstore, and to visit relatives; all were in walking distance, about a mile". Her childhood was a happy one, writes McGrath. And, she writes, "Laughter is one the greatest blessings we may have. Laughter eases stress It is good medicine for our emotional well being as well as our physical health. . . ". She says her mother was always laughing and joking, while her father was more solemn, but always wore a smile. She quotes from the Bible: "In Ecclesiastes: 1-8 "There is a time to weep and a time to laugh". McGrath writes "Yesterday is gone so we should live today to the fullest. The past experience should be an example of how to improve the future".